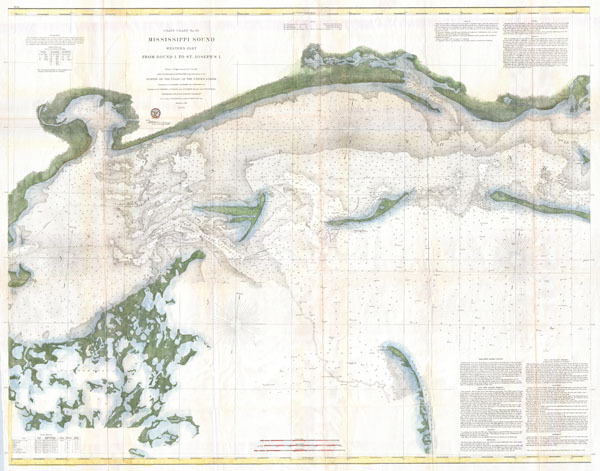 One of the most uncommon U.S. Coast Survey charts. Coast Chart No. 92 Mississippi Sound Western Part From Round I. to St. Jospeh's I. This is a highly unusual and rarely seen 1860 U.S. Coast Survey chart or map of the western part of the Mississippi Sound. Covers the coast of Mississippi roughly from St. Joseph Island (today's Grand Island) and St. Louis Bay eastward as far as Round Island and the mouth of the Pascagoula River. Offers extraordinary detail throughout including sailing instructions, notes on tides, notes on winds, identification of various light houses and buoys, and literally thousands of depth soundings. Includes St. Louis Bay, Biloxi Bay, and the Pascagoula River. What makes this chart so unusual is that it was never completed - at least not as planned. Possibly stymied by the outbreak of the American Civil War, the Western Chart was completed, but the companion eastern chart, to our knowledge, does not exist. The triangulation for this chart was completed by F.H. Gerdes, S. A. Gilbert, and J. E. Hilgard. The Hydrography was completed by a party under the command of C. P. Patterson and B.F Sands. This chart was compiled under the supervision of A. D. Bache, one of the most influential Superintendents in the history of the Coast Survey. Created in 1860, but not published until after the Civil War the 1867 supplement to the 1866 edition of the Superintendent's Report. Very good condition. Minor discoloration, wear, and some verso repairs on original fold lines.